Becoming a police officer demands agile dexterity, mammoth strength and big balls of steel, which is why it’s no wonder so few of us ever achieve such an esteemed status. 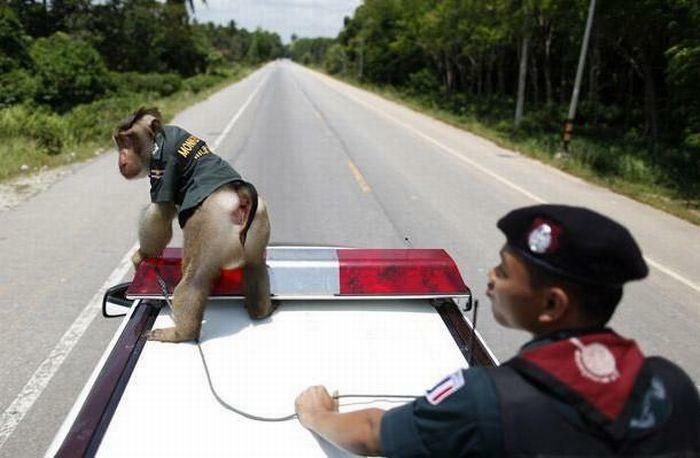 And besides us humans, the only other mammal allowed to patrol the streets is the domesticated canine, aka the dog. 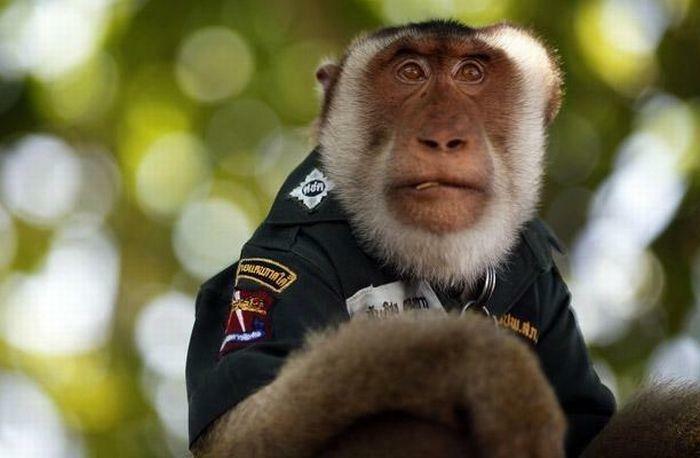 This fact has recently changed, however, thanks to Santisuk the monkey. 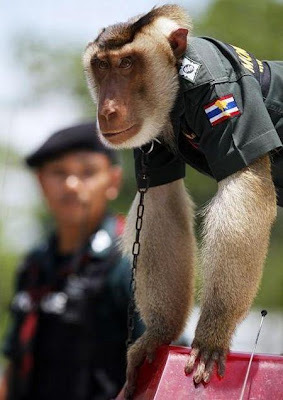 According to Thailand’s Nation newspaper, Santisuk was adopted by Pol Col Yutthapol Phromdao Yutthapol, who, after discovering the injured monkey at a local clinic, recruited him into his squad, thereby turning the simple-minded primate into the first-ever monkey cop. 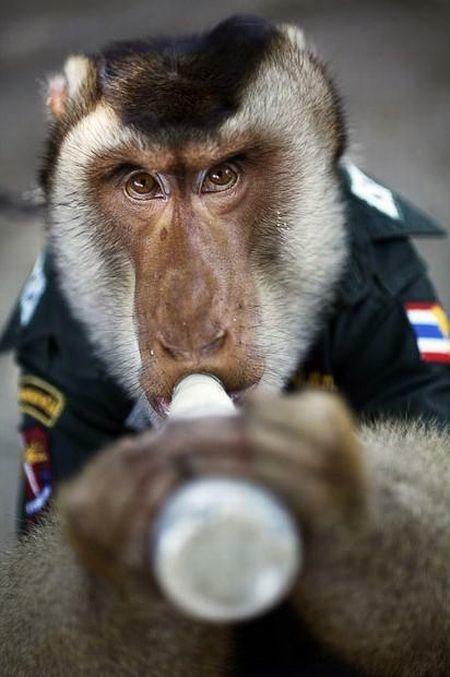 Satisuk’s tour of duty began at a local checkpoint, where Yutthapol taught him how to collect coconuts and other fruits from locals by enticing him with bottles of delectable Vitamilk. Soon afterward, Satisuk’s duties grew from mundane tasks into full-fledged public relations. 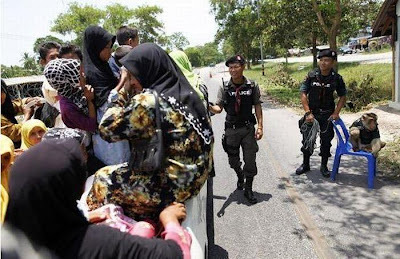 For you see, the checkpoint, one of many installed by the Thai government in response to recent attacks by Islamic separatist insurgents, was angering motorists who sought only to reach their destination as quickly as possible. By introducing Satisuk to his checkpoint, Yutthapol inadvertently calmed tensions between local police and the public. 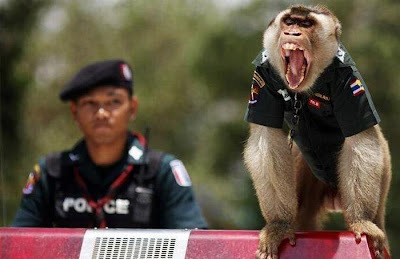 The amusing diversion—the public could take pictures or play with the furry flatfoot, instead of sitting idly by and ranting/raving about the long wait—helped calm motorists, thereby serving as a public relations ploy, per se, although that certainly wasn’t Yutthapol’s original intent. 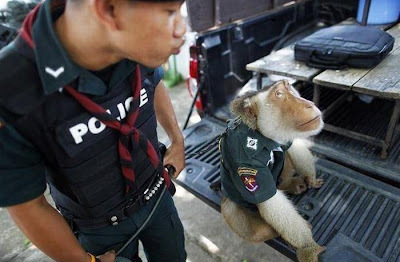 Satisuk hopefully is one of many future monkey cops to come, as the concept of improving public relations by putting a monkey police officer on the beat has inspired other departments to also try and follow suit. 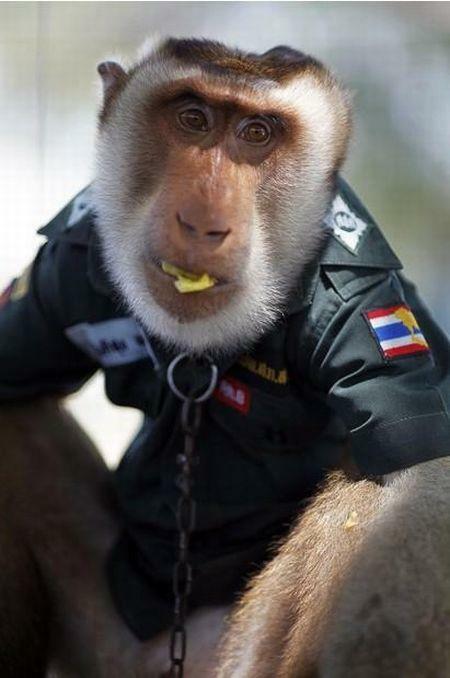 As for Satisuk, he’s having the time of life. 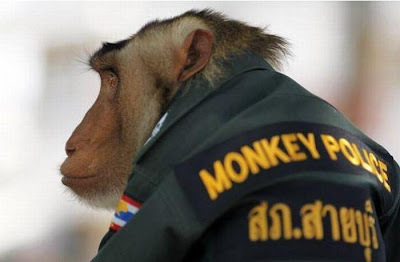 According to Yutthapol, he can be found sitting in a nearby chair, nodding his head, winking, and even monkey-talking to passing motorists.